Matthew will approach the south coast of Florida late Thursday, bringing hurricane conditions to much of the east coast of Florida Thursday night through Friday. Hurricane Matthew is expected to make landfall over Cape Canaveral Friday morning. Winds exceeding 100 mph and storm surge of 6-10 feet will batter the east coast of Florida. Tropical storm-force winds will extend inland at least 60 miles. If you are in need of our services please call the MediGroup Emergency SRM Hotline: 888.243.5760. Matthew is still a Category 3 storm and is moving through the central Bahamas. The powerful hurricane will continue to impact the central and northern Bahamas this morning. Matthew will move northwest through the central northern Bahamas today. The hurricane might intensify back to a Category 4 hurricane as it tracks over very warm water and through an environment of low shear. Winds could exceed 130 mph along the northern periphery of the eyewall as it progresses to the northwest. The combination of wind, flooding rain and a storm surge of 8-15 feet will cause major damage to structures and knock out utilities and communication towers across the Bahamas through Thursday night. Rainfall amounts across the Bahamas could exceed 12 inches. 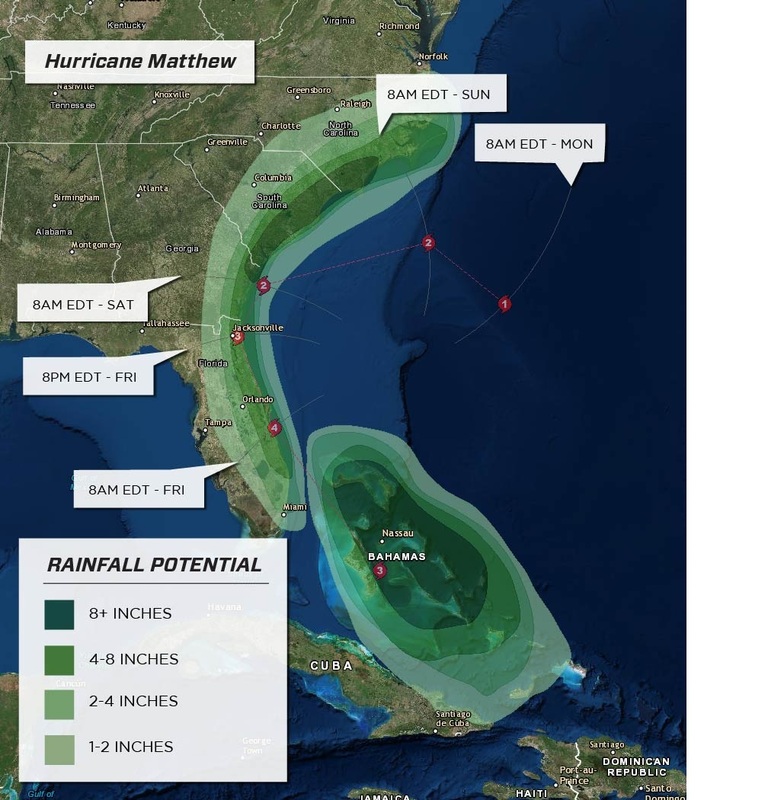 Matthew will move toward then along the southeast coast of Florida Thursday night then along or very close to the central east coast of the Sunshine State late Thursday night and Friday morning. The hurricane should still be a major hurricane as it makes landfall near Cape Canaveral Friday morning. Another possibility is the center of the hurricane might stay just off shore by 20-40 miles. 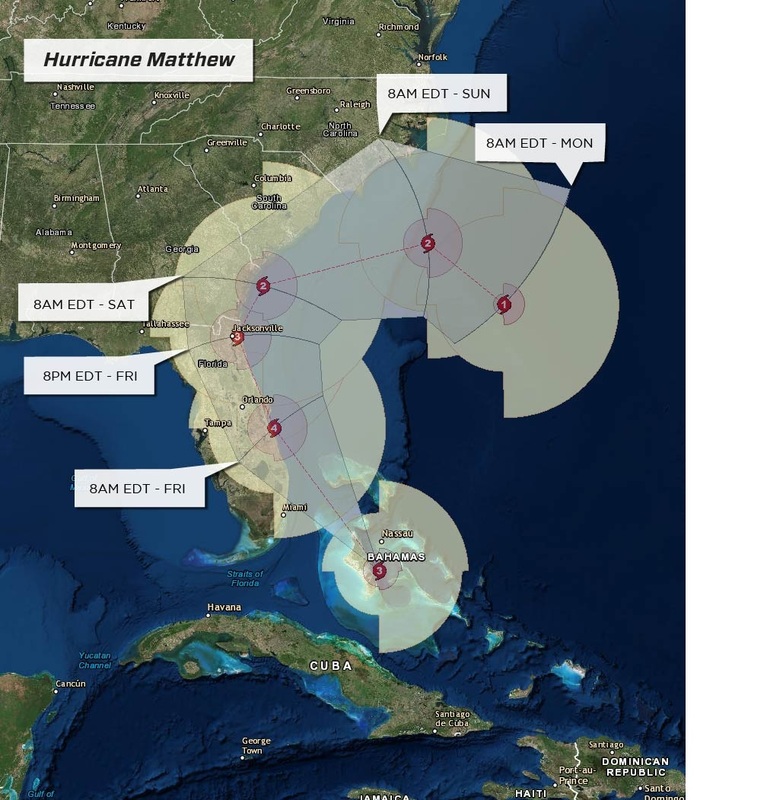 How close it passes to Florida will determine the degree of impacts. Wind gusts along the central Florida coast can exceed 70 mph and cause power outages, damage to trees and some structures. A storm surge around 6 feet, perhaps higher, would inundate large sections of areas near the coast causing further damage a threat to life. Rainfall amounts of 4-8 inches are possible and could lead to freshwater flooding. Wind gusts will exceed 40 mph farther inland across South, central and northeastern Florida. Matthew will turn north later on Friday, then north-northeast on Friday night and spread powerful winds and heavy rain into coastal Georgia and South Carolina. A landfall along the South Carolina coast is possible before it turns more toward the northeast then east during the day Saturday. 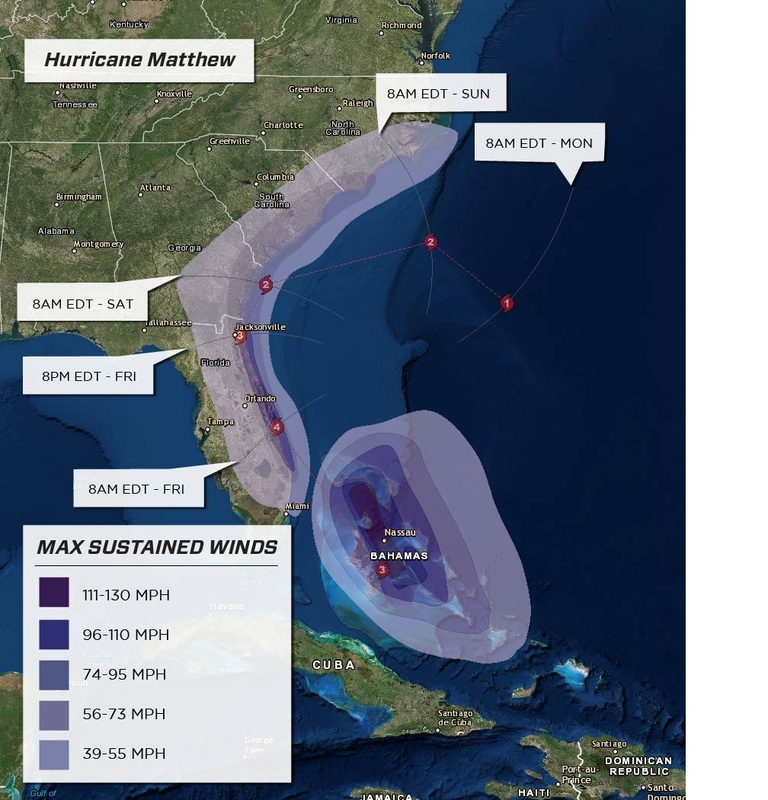 It will be close enough to North Carolina for high winds, heavy rain and rough surf to impact eastern parts of that state, especially over the southern Outer Banks and over the southeast coastal areas.